– Add whole wheat pita chips for a delicious crunch. – Add grilled chicken breast strips or shredded rotisserie chicken breasts for a delicious and healthy meal. 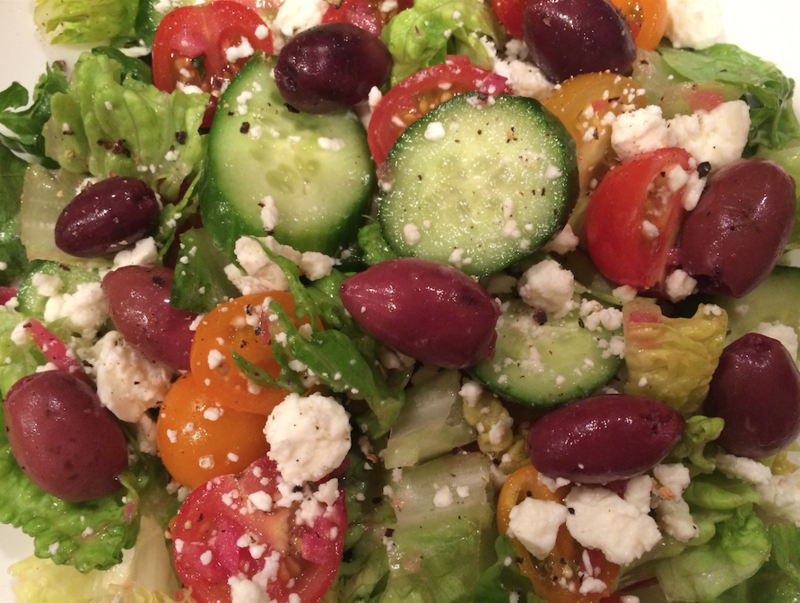 •	Drain liquid from Kalamata olives. •	In a bowl, whisk onions, oil, lemon juice, oregano, salt and pepper. •	Add lettuce, tomatoes, cucumbers, and toss well. •	Scatter cheese and olives. Serve immediately. Looking to lose your belly fat for this summer? Eating the right food with a regular exercise program can help give you a slimmer and sexier waistline just in time for the beach. Almonds contain fiber and protein. They make a great and filling snack and will help get rid of unwanted belly fat if replaced by other high calorie snacks. Studies found that individuals eating about 50 almonds a day had lower body fat than individuals who consumed few or no almonds. An apple a day does keep the doctor away. Studies found that apples contain a plant chemical that protects the lining of the blood vessels. Apples are very low in calorie and they make a great snack as they are very filling. Blackberries are high in fiber and great for your digestive system. They are also a very good source of protein. Broccoli is low in calorie and high in fiber. It also contains lost of vitamins and minerals. Egg Whites are low in calories and a great source of protein. The white in a large egg only contains about 17 calories. Salmon is very high in protein and has the essential omega-3 fatty acids needed for a healthy diet. Non-Fat Yogurt contains healthy bacteria that keeps the digestive system functioning properly which helps maintain a slimmer waistline. It is also a good source of calcium.